Veterinary calls during Halloween week increase by 12%, according to Pet Poison Helpline. This is because the bags of sweets, chocolates and tasty treats that fill the nation’s homes during this time of the year are dangerous if consumed by dogs. Therefore, when you’re planning fun family activities this Halloween, make sure the entire family know and understand the items which pose a risk to your beloved pooch. While trick or treating is a fun and enjoyable activity for your kids, it will likely scare your four-legged friend. Constantly hearing the doorbell ring and seeing groups of people at your front door will be unnerving for a hound who strives off routine. 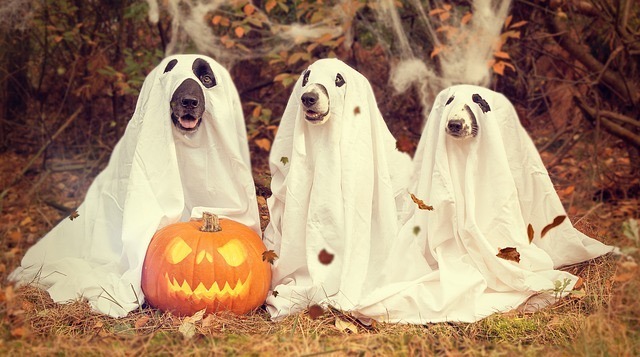 But add in strange outfits, scary masks, and face paint and your dog will likely become anxious and scared. Therefore, you should take steps to keep your dog as calm as possible on October, 31st and find a safe and secure place for him to rest while your family enjoys the spooky celebrations. Theobromine is a chemical found in chocolate which is poisonous to dogs. Dark chocolate typically contains higher levels of theobromine than milk and white varieties. Pet site, Breedsy (breedsy.com) states that: ‘With chocolate, the darker the chocolate, the more it can affect your dog.’ White chocolate is very unlikely to cause poisoning due to a limited amount of theobromine contained within it. However, the sugar and fat content may still cause a nasty stomach upset in your hound. As a general rule, if your dog consumes close to 20mg of chocolate per one pound of his body weight, immediate veterinary treatment should be sought. Xylitol is a sweetener which is added to sugar-free candy and various other products, including peanut butter. You’ll most commonly find xylitol in hard candies, mints, and gumdrops. The biggest concern at Halloween is not knowing which version of the candy your kids have picked up from your neighbors’ while trick or treating. Therefore, to be on the safe side, keep all candy out of your dog’s reach and ensure your children enjoy them while supervised to prevent a cheeky dog from tricking your little ones into sharing their treats with him. You might think that your pooch is safe once all the candy has been consumed and there’s nothing left other than a pile of candy wrappers. However, these wrappers will be enticing to your hound. Most dogs are notorious chewers and will chew and eat anything they can lay their paws on. But, plastic and tinfoil candy wrappers and lollipop sticks can cause intestinal obstructions in your dog’s body which will require costly x-rays and surgery to resolve. Therefore, for everyone’s benefit, make sure your kids sensibly dispose of packaging as soon as they polish off their tasty treats. Halloween should be a joyous occasion for all the family. However, spare a thought for Fido this season as it can be a dangerous time for hounds if precautions aren’t taken to protect him from Halloween traditions.